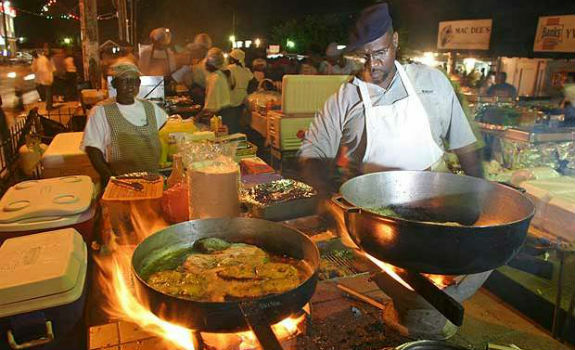 It’s Friday and on the island of Barbados that means it’s time for Oistins Fish Fry. What’s that you ask? Only the best spot for an eclectic mixture of tasty eats, yummy drinks and Bajan music for locals and visitors. Back in 2010, when Shannon and I headed to Barbados for the first time, we got gussied up in our dresses and walking heels and hit the town around 8 p.m. with cash in pocket. When we arrived at Oistins, which is a cluster of food and drink booths surrounded by picnic tables and clothing and trinket vendors, we realized that, first, we were over-dressed and, second, we were about to get into some serious food. At the outdoor market on the island’s southern tip, cuisine choices included fresh fish like tuna, swordfish, marlin, mahi-mahi, red snapped, and flying fish, the local favorite, along with lobster and chicken. And it doesn’t hurt that the grandmother of the @parlourmagazine roomie I always mention sold fish at this very market back in the day. How cool is that? During our first trip, Shannon and I settled on a booth called Shirley’s with grilled lobster on the menu and hints of La Cosa Nostra. By that I mean, the servers asked us what we wanted to order, then sauntered over to a woman sitting quietly in the corner, to whom they whispered, then the woman, who we later learned was Shirley, whispered back … and then we got our checks. We loved the mystery of it all, not to mention supporting a black woman’s business. What’s not to like? 1) Wear comfortable clothes, including low heels, if any. Don’t be the girl struggling in stilettos while everyone else is doing grooving to Rihanna and Alison Hinds with a drink in hand. Be prepared to sway to Bob Marley classics and wind it up to this year’s Crop Over hits. 2) Don’t eat heavily before you go, there is plenty of food so you’ll want to reserve space. 3) Bring cash, meals are around $30 Bajan and drinks are about $10-20, depending on your fanciness. 4) Find a booth and eat a few fish cakes. OK, that’s my personal tip because fish cakes, chopped fish fried in batter, are delicious. 5) Don’t be afraid to chat it up with the locals. We met the most lovely duo during our last trip and it was over surfing chatter and rum punch while sitting at a picnic table. 6) Find the booth helmed by the former chef of the prestigious restaurant, The Cliff, think it’s called George’s. You’ll know you’re in the right place because the line will be extremely long. 7) Don’t be the fool that is sloppy drunk and dancing on the Oistins stage, you don’t want to be the next contestant on that social media screen Saturday morning. 8) There are plenty of taxis outside of Oistins but your easiest bet is to ask the driver you hired on the way to Oistins for a return trip as well. Exchange numbers and text or call him or her when you’re ready to depart. By the night’s end, you’ll be good and toasty and who wants to spend precious drunken moments negotiating a ride home? Been a couple years in a row! I know a little bit about Oistins. =) What are you and wifey doing in Nov. want to join us in Barbados? We got them hotel rates at a discount!